Today I have another picture heavy review for you guys! And if you scroll down to the bottom, there is also a video review! You can watch me applying each of these to my nails and hear a more ramble-y review. My videos tend to be long and drawn out, so hopefully this picture heavy review says more about these polishes that I ever could. Today I have the Gaslighted Collection from Wonder Beauty Products. This is my first time trying out some of Wonder Beauty Product’s Super Chic Lacquers. All of these polishes remind me of the super popular Takko Lacquer polishes, where its a creamy base with a strong colorful shimmer throughout it. The collection comes with 5 shimmer polishes that are a part of the Here Comes the Sun Spring/Summer 2014 collection. 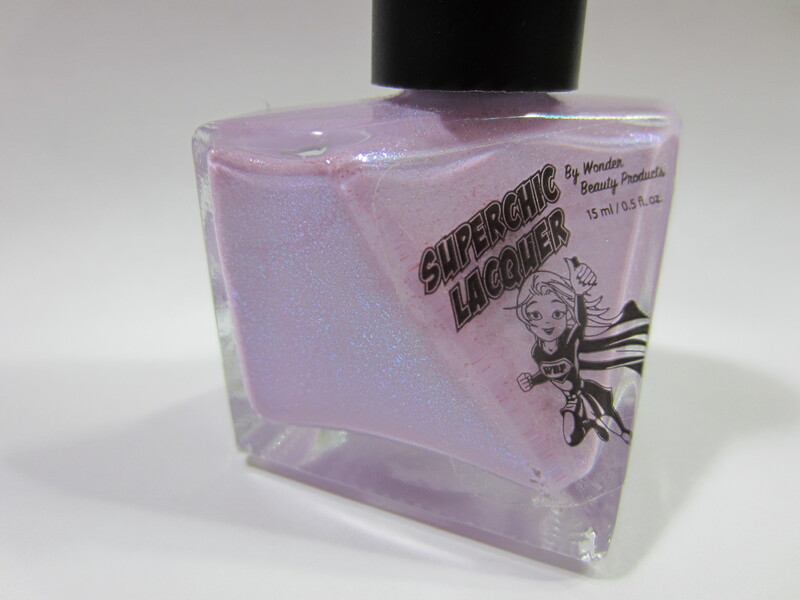 Super Chic Lacquer describes Lost my Melon as a gorgeous melon- coral shade packing a punch of strong shimmering fuchsia-violet color shifting iridescence, with a melon chrome cast. Lost in Melon is a melon pink shimmer with a ton of of pink shimmer running throughout it. My pictures show it a silver shimmer, but I promise, this polish definitely glows with pink, coral and gold. It is absolutely gorgeous for any of you who like melon/coral shades. This is 2 coats and I would suggest doing thin coats with these polishes. 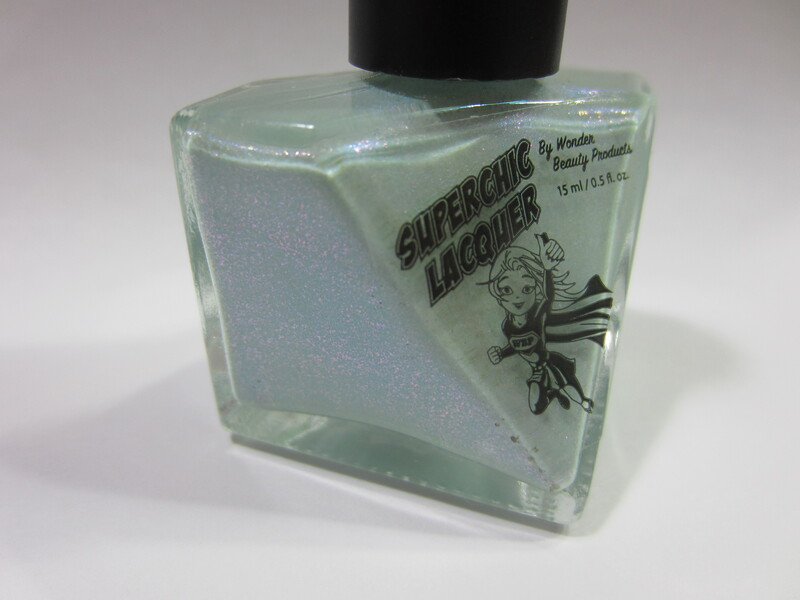 Super Chic Lacquer describes Figmint of my Reality as a perfectly stunning minty shade featuring an amazing blue chrome over cast, with a strong shimmering fuchsia-violet color shifting iridescence. Figmint of my Reality is a light mint green shimmer. Again, don’t judge this polish by my pictures because the shimmer shows up much stronger in real life. If you want a true depiction of the color, check out the video below. Y’all know that I love green polishes, in all forms! So naturally, this one was going to be one of my favorites. This is 3 thin coats. I found that these polishes are best applied in thin coats because if it’s too thick, they apply really unevenly. Super Chic Lacquer describes Shrinking Violet as a sheer violet with radiant flashes of blue chrome adorned with blue-green color shifting iridescence. Shrinking Violet is a lavender creme with a strong blue-green shimmer. Just look at those photos! This one was my hands down favorite of the entire collection. My photos don’t capture how intense the color change was, so just know that its much more prominent in person. Normally my skin tone hates all light purples, but this is one that I feel I can pull off. I’m wearing it right now actually! This is just 2 coats. Super Chic Lacquer describes Coming Unblued as a magical Cinderella blue chrome shimmer cream packed with blue-green iridescent goodness, with chrome violet interference color shift. Coming Unblued is a baby blue with a blue shimmer. This is kind of what I wanted Sinful Colors “Cinderella” to be. The shimmer is really prominent on the nail, but not as strong as the other polishes in this collection. The formula is similar to Figmint of my Reality, where it requires 3 thing coats to be opaque. Super Chic Lacquer describes Fuchsure Drive Me Insane (sounds like “you-sure”) as an insanely gorgeous blended fuchsia shade adorned with slight reflections of blue chrome and brilliant flashes of shimmering blue-green color shifting iridescence. Fuchsure Drive Me Insane is a medium toned warm purple with a strong blue shimmer. For all of you who love shimmer, YOU NEED THIS! Seriously, this is the polish that I have a feeling a lot of people are going to go crazy over because its so unique and so gorgeous. This is another one of my favorites from the entire batch. This is just 2 coats. All of the polishes had the same formula. The formula wasn’t too thick and wasn’t too thin, the perfect goldilocks in between. Also, the dry time for all 5 was fast. 2 of the polishes required 3 coats, but the others only needed 2. One thing I will say is that each polish needs thin coats. Normally I like to do thicker coats, but these polishes didn’t really level out and it made it appear that some parts of my nail was thicker than others. So keep your coats thin and you’ll be fine. 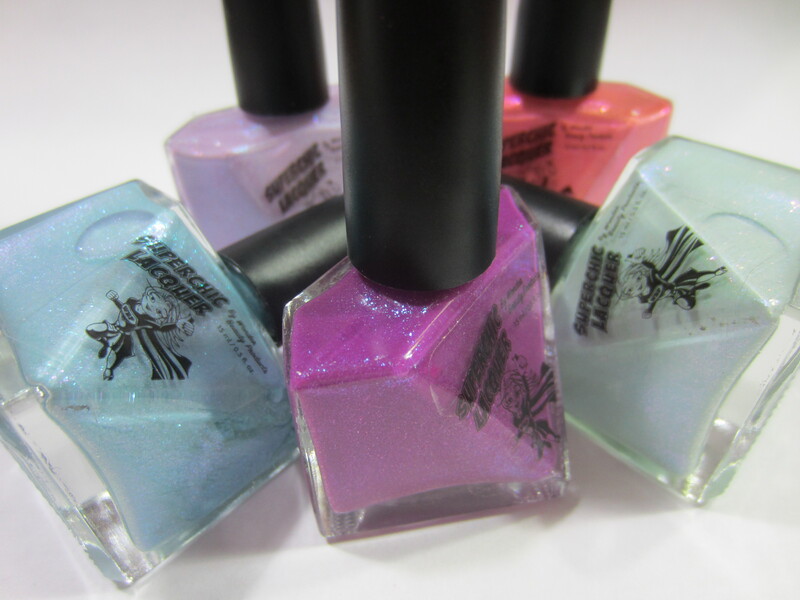 My favorites from the collection are Figmint of my Reality, Shrinking Violet and Fuchsure Drive Me Insane. I’m loving Shrinking Violet right now, so much that I’m wearing it now and I keep looking at my nails as I type this. Also check them out on Instagram, Facebook and Twitter! And make sure you watch the video! The colors are more accurate and you can see my applying each shade. That should give you a better indication of what the formula is like on each polish. I am not a purple lover (well not on me anyway) BUT the blue shimmer in these definitely makes them unique to my eyes – I suspect they’re going to be very popular. Lovely swatches and review, looking forward to watching the video later 😀 No idea how you find the time to do it all but glad you do! Great swatches. 🙂 I Lost My Melon is awesome – I love shimmery coral-pinks like that. awww thank you so much! and thanks for reading and commenting! Omg they are all so pretty ! jen did an amazing job! i’m starting to branch more into indies. what are some of your favorite indie brands? Believe it or not, I’ve only tried maybe 6 or 7 indie brands. Im lucky to have a bunch of Brijits Digits though 🙂 ! i have my eye on some brijits digits! but i have my eye on so many indies that my bank account can’t handle it. Wow they are way to cute! Fuchsure Drive Me Insane is absolute my fave. awww thanks viv! and thanks for reading and commenting! Omg Holly! I love all of these! Now I will have to place an order 😉 I love the light purple the best! And also the darker purple & the blue.